In his keynote at the Integral Spiritual Experience, [Ken] Wilber described Unique Self as “something that is extraordinary, and historic, and not to be denied.” I want to share some of what I see as historic about the Unique Self teaching, and why its birthing has been one of my primary commitments over the last two decades. Unique Self is vitally important because it reclaims the centrality of the personal as a primary category in discourse about the realization of enlightened consciousness. Enlightened consciousness itself is a fundamental category in the integral spiritual discourse because it is the implicit or explicit goal of virtually all of the great spiritual traditions that inform Integral Spirituality. Even if one assumes that most of the adherents of the great traditions, and most integral practitioners, have not and will not fully realize the goal of enlightenment, setting enlightenment as the goal shapes and defines the norms of a community, even if only partially realized. Particularly since the infusion of Eastern influence on the mind of the Western seeker, there has been a root assumption that enlightenment is an impersonal realization, which is achieved when the sense of the personal, and the particularity of personal uniqueness, is in some sense overcome. The entire goal of the Unique Self teaching has been to challenge this assumption, and thereby clarify the nature of enlightenment. 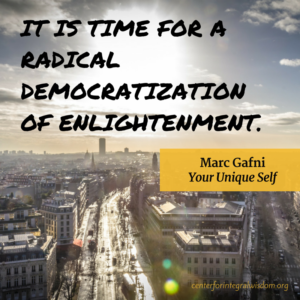 By recognizing the important role of the personal in the enlightenment process, the Unique Self teaching shifts the nature and the goal of all spiritual practice, as well as shifting the core myth and method of the enlightenment community. Before the Unique Self paradigm began to change the conversation, the reigning assumption of the enlightenment discussion was that the personal is the realm of the separate egoic personality. 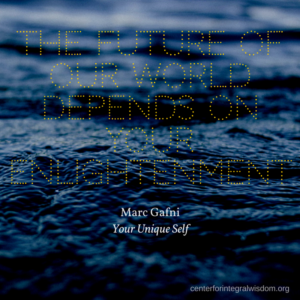 The goal of enlightenment was widely assumed to be one of evolving beyond ego. When this process took place, and one achieved a stable realization of impersonal unqualified awareness and identity with the emptiness of all that is, enlightenment was said to be achieved. The Unique Self teaching points out that this partial understanding of enlightenment is a false conflation of separateness and uniqueness and results from the confusion of the personal and the personality. This partial understanding is also a result of the fact that the traditions were formed in a pre-­modern context before a complexity of perspective had been fully realized. As a result, a pre-­modern lack of awareness on perspective naturally dominates the enlightenment discourse today. The core confusion between separateness and uniqueness is this: Eastern traditions have historically believed that we need to move beyond separate self in order to be liberated from suffering and realize enlightenment. The East, however—speaking of course in orienting generalizations that will always be partially unfair–tends to conflate separateness and uniqueness, and in rejecting uniqueness implies that authentic spiritual experience is essentially the same in every person. As one teacher influenced by the East put it, “There is no such thing as a unique spiritual experience.” Many Eastern teachings therefore insist on transcending separate self for True Self and assume that uniqueness must be left behind as the province of ego. Diametrically opposed to this is the conventional Western spiritual viewpoint, which assumes separate self to be the source of all dignity and human rights. Thus, the West rejects the Eastern demand to transcend separate self for True Self, but, similar to the East, conflates separateness and uniqueness. That is, the West assumes that in order to affirm human rights and dignity it is necessary to reify the separate self. It is my belief that the Unique Self teaching offers a higher integration of these Eastern and Western perspectives. The East’s demand that we transcend separate self in order to be liberated from suffering can be honored and heeded—separate self can be left behind, and yet Unique Self will be fullly affirmed, once we discern between separateness and uniqueness. The Western affirmation of human rights and dignity, rooted in the irreducible nobility of the individual, can also be honored and heeded. One can realize that one is part of the all, leave separate self behind, but still be a fully distinct individual with full human dignity and rights. The difference is that this dignity will be based on Unique Self, not the separate self. Core to Unique Self theory is the mapping of the three distinct stations of self: separate self, True Self, and Unique Self. Through this journey we realize that the personal is not left behind but rather is evolved. At station one—that of the separate self—the egoic personality may well incarnate all the vices of Christianity and all the poisons of Buddhism. It may well be essential, as the great traditions teach, to transcend the narrow personal nature of the separate self-­personality for the impersonal True Self of classical enlightenment to emerge. But the goal of enlightenment is personal plus, not personal minus. The deeper realization of True Self is Unique Self. This third station of Unique Self realization brings the personal back online as the very expression of enlightenment through the personal face of essence and emptiness. The station of True Self finds the total number of True Selves to be One. This, however, is only true in the realm of un-manifest One-ness, as there is no True Self anywhere in the manifest world. Why? Because every individual’s awakening to this Oneness arises through his or her own unique perspective. 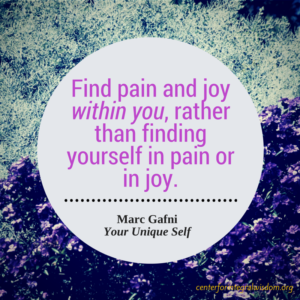 In this way, True Self + Perspective = Unique Self. Any experience of formless True Self, when it manifests through an individual, manifests as the Unique Self. So to repeat, there is no True Self anywhere in the manifest world; there is always a perspective. That is to say, True Self always manifests as Unique Self—only pure formless unmanifest awareness is pure perception without a perspective. In this un-manifest state there are no objects, only consciousness without an object, so there is nothing to take a perspective on. This can be said to be the unqualifiable True Self. But we always live in the world of manifestation. Once the awareness of True Self manifests, it does so through a particular perspective, which is Unique Self. This means that Unique Self is always the source of awareness. In fact, Unique Self is always present as the witness of consciousness at all stations of awareness because awareness or consciousness is always embodied in form and therefore always has a perspective. Unique Self is the actual origin of awareness at all stations of development, even though it only comes online naturally as conscious awareness at a particular stage of development (what Integral Theory has referred to as second-­ or third-­tier levels). However, Unique Self is always present as the deeper realization of any True Self state at every level of consciousness. In the pre-modern world, with rare exceptions, there was little awareness of perspective. The assumption was that the observer saw reality as it was. Modern and postmodern thinking evolved our essential epistemological lens as we began to understand that all of reality was mediated through the perspective of the observer. The pre-modern teachers of enlightenment were subject to precisely the same error as pre-modern philosophers and scientists. Therefore, when spiritual teachers taught the realization of true nature as True Self, they also taught that all True Selves are the same. This implied that any sense of uniqueness was con-­ nected to the level of separate self or personality, and therefore was in contradistinction to enlightenment. As we’ve seen, that teaching is true but partial. With the emergence of second tier, and particularly third-­tier structure stages of consciousness, the multi-­faceted nature of perspective becomes noticed. So at these higher stages, the conscious realization of Unique Self fully emerges. Unique Self was, of course, present all along but tended to be confused with True Self because perspectives were not yet fully conscious or differentiated. When the full awareness of perspectives emerges, the awareness of Unique Self also emerges. Then, any experience of formless True Self, when it manifests as any object at all, manifests as the Unique Self. In other words, the recognition of Unique Self is a process: You first realize that you are part of the seamless coat of the universe, then you go on to realize that the universe is seamless but not featureless and that you are actually one of its essential features. You realize that your personal existence, your personal being, is utterly distinct, worthy, and needed. To be unique means to be irreplaceably singular, a constitutive exception to the universal, an un-objectifiable secret that resists full articulation or appropriation in any system of meaning-making. In this sense, the Unique Self is not subject to any totalizing tendency and infinitely exceeds all such systemizing approaches. Unique Self is an expression of irreducible singularity. But that is only part of the story. It is precisely the singularity that merges and integrates the one into the Single One, which is the ultimate universal, the whole in which every part participates. This paradoxical insight is the essence of the nondual realization of the self as Self. Paradoxically, the source of one’s Oneness with all that is, is one’s Unique Self. Unique Self might be described as the puzzle-­piece nature of one’s essence and emptiness. 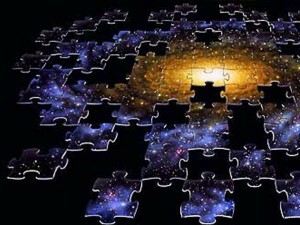 Like a puzzle piece, Unique Self is both utterly unique and distinct, yet paradoxically it is that very uniqueness and distinction that merges one with the larger context of all that is. While separate-­ness separates one from the larger context, uniqueness integrates one in the larger context. As Unique Self, you are free from the contractions of your personality, even as you experience yourself as personally engaged and uniquely incarnate in the great evolutionary unfolding of consciousness. In Unique Self enlightenment, you recognize and realize your nature as indivisible from the larger field of consciousness, even as you know yourself to be an absolutely unique expression of True Self, unlike any other. True Self always looks out through a unique set of eyes, which reveal a radically unique and special perspective through which the evolution of consciousness unfolds. And it is only through Unique Self that we can embrace the individual uniqueness of the self while at the same time realizing the true nature of the individual as both an indivisible part of True Self, the seamless coat of the universe, and as the whole itself in which all consciousness arises. This realization is the source of the irreducible dignity of every human being. It is for this reason that we affirm the inalienable right of human beings to live their unique story and to have that story told and received. In short, this nondual realization of Unique Self can serve as the basis of all intersubjective ethics. It is worth pointing out at this juncture, as we have already alluded to above, that Unique Self does not refer merely to the uniqueness of soul described in the great traditions. A common assumption is that uniqueness is a soul quality but once we ascend beyond soul to spirit, uniqueness disappears. This assumption is undermined in the Unique Self teaching, which realizes that unique perspective is the deeper quality of True Self. At the same time, we must constantly distinguish between Unique Self and the soul station of uniqueness, at least in the limited understanding of the word soul, which still expresses a subtle body level of separate-self ego. The word soul is used in so many ways in the great traditions that in every context one must identify what is being described. Sometimes soul is used in a way which is identical to True Self. Often, however, soul is used to describe what is actually the first station of post-egoic clarification, the subtle realm that is only then deepened into causal or formless True Self and then nondual realization of Unique Self. When soul is used in this latter sense, we need to distinguish the unique of soul from the unique perspective of True Self, which is Unique Self. At this point it is worth pointing out that in integral terms, it would be accurate to describe Unique Self both as a structure-­stage of consciousness and as a state of consciousness. Unique Self is a state of consciousness, which, like the experience of classical mystical enlightenment, is available to anyone at any structure-stage of consciousness (e.g., a flow state). However, in second-tier stages of consciousness, when perspectives are revealed as an essential structure of higher consciousness, the Unique Self naturally reveals itself more and more. In developmental psychology terms, the fullest flowering of Unique Self might best be articulated as a living glimpse into indigo altitude (see Wilber, 2006, p. 68). This is the stage of evolution of human consciousness at which my felt sense of the ever-present unity of reality–a state of ongoing “flow presence,” if you will–and the unique characteristics of my own life and perspective intersect and find a cohesive and stabilized integration. Perspective is an inherent part of realizing indigo altitude (i.e., personal perspective is acknowledged even as one recognizes other perspectives). In these highest stations of consciousness, paradoxes begin to resolve only to, of course, produce new and higher paradoxes. At these higher tiers of consciousness, it might be said that states and stages merge in a higher integral embrace, and a great evolutionary milestone is achieved. It is worth adding to this description that higher states of consciousness yield more advanced recognitions of uniqueness. Paradoxically, the more evolved the expression of uniqueness becomes, the more precisely the unique puzzle piece is able to fit seamlessly into the larger whole, even as one realizes their identity with the larger whole. It is at this paradoxical pivoting point that complexity surrenders to a higher simplicity. Indeed we might identify this evolved state-­stage and structure-­stage of Unique Self as the level of second simplicity, which is a simplicity that transcends and includes all of the previous complexity. It is at this paradoxical pivoting point of Unique Self that the Western and Eastern enlightenment visions might meet together in a higher dance of integration. Enlightenment, as understood in conventional Western discourse, affirms the dignity of the personal. It views enlightenment as the achievement of a structure-stage of consciousness in which the affirmation of the dignity of the personal is fully internalized. Eastern enlightenment (and Western mystical enlightenment) is understood as a state of consciousness in which identity is achieved with the impersonal nature of all that is. 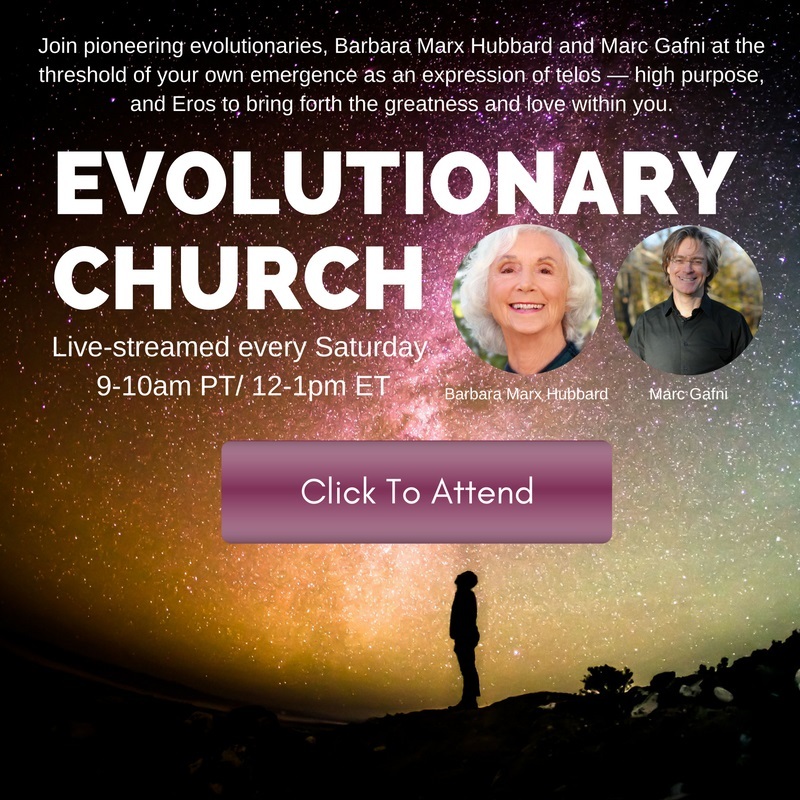 West and East, personal and impersonal, structure-­stage and structure-­state, meet in the embrace of the evolutionary emergent of Unique Self.